There is a black and orange female cat that I am sure is someone's lost pet in the White Rock and Rickey area. She is very sweet and I am trying to find her owner. I have asked several neighbors, who told me she showed up about 6-8 weeks ago. I have placed ads on Craig's list, Tabby Tracker and with the Human Society. Attached is a photo of the cat. 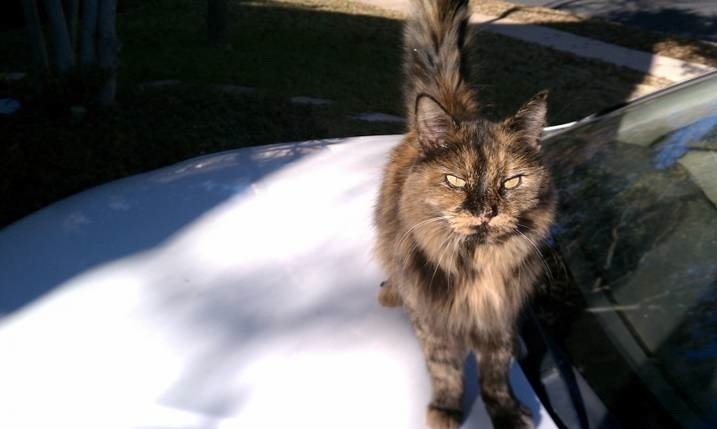 She is a domestic long hair, with gold eyes. I am fairly certain she has been spayed. Also, her tongue sticks out a bit when her mouth is closed! I can be contacted by email at giddens5 [Email address: giddens5 #AT# yahoo.com - replace #AT# with @ ] or by cell at 402-984-5826.